Just four years ago, Wigan’s relegation season of 2014/15 (as recalled in the The Guardian) was punctuated by long runs without a win, the worst of which saw Latics take just seven points from a possible 48 between 1 November and 11 February. The Latics suffered a similarly barren run in the December of 2016/17, and again, relegation ensued. There has been more than a repeat of that this season, although – thankfully – it has been restricted solely to Wigan’s away form. Damningly, after beating Stoke 3-0 away on the second away league trip of the season, Wigan took just two away points out of the following 39 available. Barring a complete turnaround in form on the road, it’s crystal clear that the Latics will be entirely reliant on home form from now until the bitter end. And so, with Wigan playing no less than four times at home in the space of 29 days from 2 February, the coming month will be a telling one where the survival campaign is concerned. Here’s what to look out for over the next few weeks at the DW Stadium. 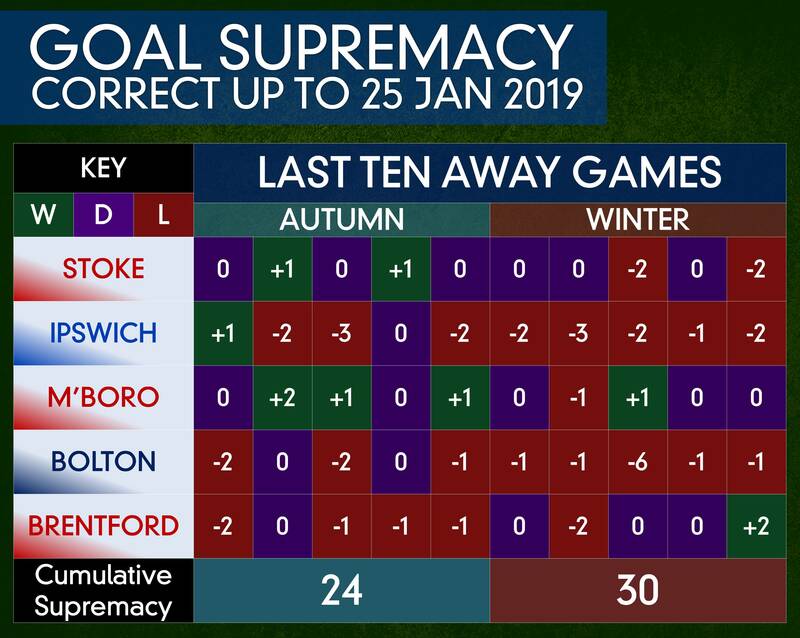 The jury’s out: It’s very much a case of ‘draw your own conclusions’, although a Wigan win-to-nil should be a given at home to Ipswich, while Brentford looks likely to be a low-scoring encounter. The main expectation is for more dramatic scorelines and bigger winning margins, and with Wigan (as of 28 January 2019) priced at just 11/1 by Betway to suffer relegation, the Latics will definitely need to aim for some big wins. Where Wigan are concerned, the back end of November saw a sudden, unexpected shift from tight games characterising the DW Stadium to ones that saw big winning margins either way. As can be seen on Soccerway, prior to Wigan’s 3-1 home win over Blackburn (28 November), every one of Wigan’s home matches had produced a scoreline that separated the teams by just one goal – or not separated them at all. Following a 1-0 defeat to Derby County, Wigan saw three consecutive league matches produce a 3-0 scoreline either way. Only the most scrupulous of Wigan experts could possibly identify the last time – if there is one – that such a sequence has been produced. 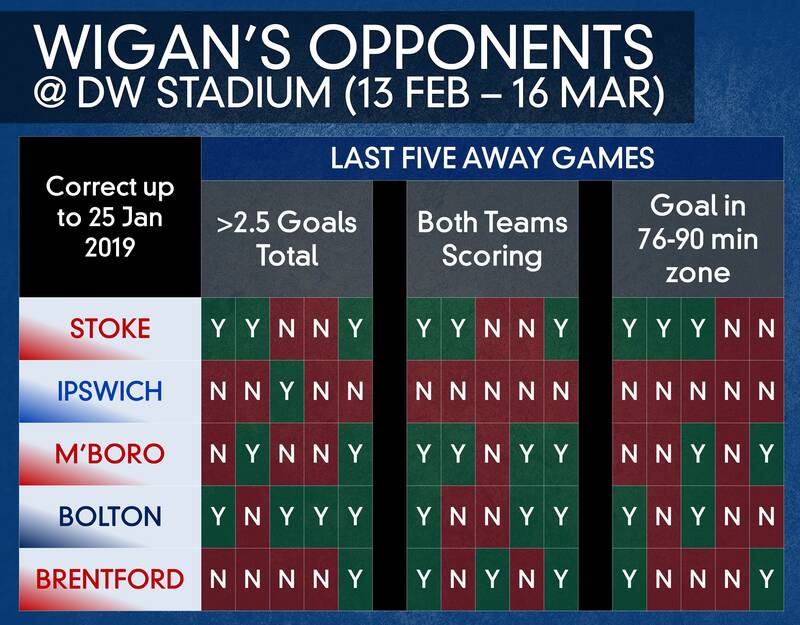 Wigan’s trend of more emphatic winning/losing margins at home has also seeped into the away fixtures involving their upcoming visitors to the DW Stadium. When a team is fighting for survival, bookings are inevitable, but it is on Wigan to curb their enthusiasm at home when taking the ‘crowd effect’ into account. In that regard, the Latics are already well on their way to becoming the next discipline case of the Championship. 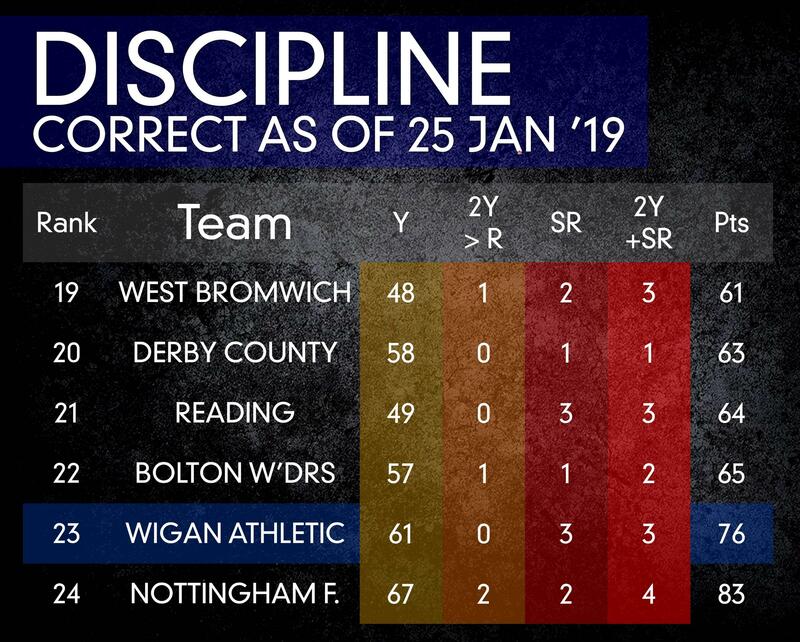 As of 25 January (according to Transfermarkt), Wigan lay second-bottom of the disciplinary charts, taking 76 points to Nottingham Forest’s 83. Wigan’s ratio of fouls to straight red cards was also without equal, and they also had the distinction of being one of just two teams (along with Reading, whom Wigan play away on 9 March) to have three straight reds. With Bolton also lying third from bottom of the disciplinary at the same point, the Lancashire derby on 16 March is sure to be a particularly feisty one, with plenty of set-piece opportunities. Ultimately there is no escaping the fact that Wigan may all too soon be forced into an ‘all or nothing’ game plan. This should be especially true of home games, with Wigan fans roaring the Latics on and provoking the younger members of the squad to let their hearts rule their heads. This will undoubtedly work against the likes of an apparently-doomed Ipswich team and a Bolton side with problems on and off the pitch. Recent matches – particularly the 3-0 home humbling to Sheffield United on New Years Day – have shown the ugly side of any Hollywood-style attempt to go on the attack with aplomb. Of course, it works occasionally, and with the Latics’ unexpected 3-0 home victory over Aston Villa on 12 January being a case in hand, there is just as much reason to believe that a more gung-ho approach will work. From a neutral perspective, teams that play with bravery and fall are respected above those who play it safe – and survive indefinitely – until the time precipitates the inevitable.